Alojamiento Web Compartido Tu sitio o negocio online en minutos! Alojamiento Web Su web online en minutos! Servidores Dedicados Tenemos un servidor para sus necesidades. Servidores Dedicados Pro Servidores Dedicados Pre Configurados para lo mejor! Alojamiento en La Nube Servidores Virtuales y Aplicaciones en La Nube! Servidores Cloud Configuralo a tu gusto ahora! Registro de Dominios Registra tu dominio con nosotros! Area de Clientes Vea sus informacion, servicios y facturas. Tickets de Soporte Enviar o ver sus tickets de soporte. Afiliados Gane hasta 25% de Comision! Todo lo que queria saber sobre nuestra empresa y su historia. We started in 1997, and since then, we offer our clients many if not all the tools to set up a good business in "the net", from simple domain registration or hosting to a full rack of dedicated servers, as well as a logo or a full corporate design for a brand or product. Hundreds of companies and individuals grew with CAS Networks, thanks to the experience we have achieved with so many years in the market. We invite you to be part of this group and grow your business with the hand of a safe, quality, and above all, non-volatile service, wich will allow you to grow and scale their resources tailored to their needs. CAS Networks, with more than 20 years in business, the security and reliability that your project or company requires. In the beginning, providing graphic design and hardware services/sales and starting to migrate graphic to web design. At that time, many places in the world were using Dial-Up, with 33.6kbps modems, speeds that are negligible today. Internet was in the beginning just like us, just few people in the world had access to this service that started in 1995. Nothing was known of Google, Facebook or Twitter, things that people can´t live without now. At this time, we began to incorporate HTML coding, in order to offer what we know as "Web Design" now, by then, a novelty! Thus by mid-1998, we already had several designs in "The Net", this of course, moved us to the next step, the need to also offer our customers the place to put the pages we designed, then we do it, we put a dedicated server in a local provider, being one of the first serious services in the area. To offer our customers a complete solution, and with our own dedicated servers (Windows NT/FreeBSD) housed in a local ISP in Argentina, we started offering hosting packages mostly for local customers. We continued with hardware sales, computer builds and IT related services for business and individuals, and also continued growing our Web Sites online, and making happy customers one by one. With the evolution in communications, with the advent of cable modem and ADSL, we felt the need for another change of direction, so then with greater speed and stability requirements, and building the possibility of entering the world market, we moved our data center to the United States, and with the help of cPanel/WHM 3.x we also started to offer reseller accounts on our servers. This is the start of true >99.9% Uptime. Our resellers were growing, and this pushed us to the next step, start to offer Dedicated Servers was an absolute need, at this time we registered cascompany.com, and with a range of servers like Pentium III´s, we started to offer, not only Servers, but VPS, Resellers, Hosting, Domains, and Web Development world wide from our US Data Center. 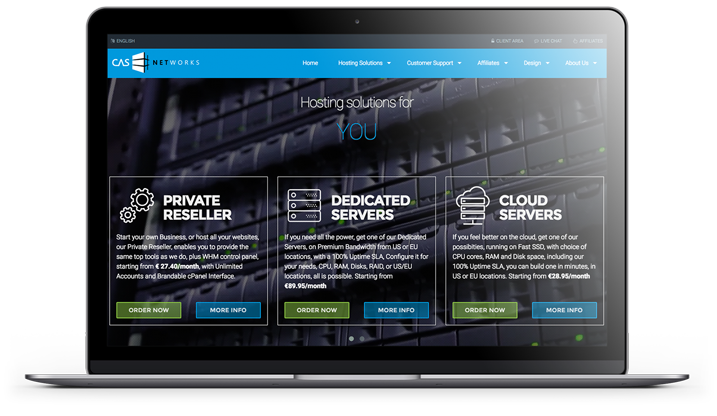 All clients of NexoHost, a Peru hosting company, with thousand of clients, that had some issues and finally closed, were acquired by us mantaining their purchased plans but on our US servers now. At the time of renew, some of them left by their own because of previous issues they had, but some of them are still with us. The connections evolved, and still do, from 256k to 512k, 1Mbps to 6Mbps, together with the evolution, we evolved our service, from the initial 1Mbps connection that servers had, to 10Mbps, 100Mbps, or even 1000Mbps connection speed on each server, since single Pentium III 1Ghz, to Multi-Core Dual Xeons with thousands of MHz and up to 12 cores, we still have >99.9% Real Uptime. In 2011, we renewed our image and web site, and also, we started to work with our New York DC, to assure our customers, connection speed and responsiveness to meet the world demands. New York have the best global latencies and is connected to main US back bones, allowing us to continue providing world class bandwidth and good prices. World economy and country politics put us in the need to move our offices to new location, in order to continue providing all our world customers the same service that they used to have. We moved to Spain to now operate as CAS Networks S.L, with the same service our customers loved us for, now from Barcelona, a beautifull and very innovative city in Europe. With a refreshed look on 2016, this year will be important in the future, we start to be known a CAS Networks, with a new corporative image on this name, we have also new objetives, we started with a new Central Europe location for servers, and we look for more too, looking for best locations worldwide. We have been in the market for 20 YEARS now, and continue to offer the same premium service and 100% Uptime SLA as we did in the last years.